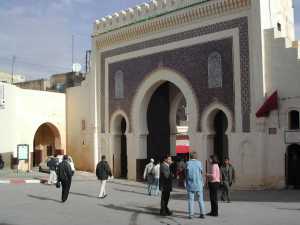 The planning for this RHATT tour of Morocco began in the spring of 2005. 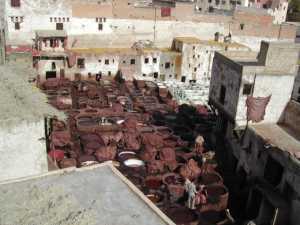 We chose Morocco because the weather would be ideal at that time; in the initial planning, we decided a one week tour with stops in Casablanca, Fes and Marrakech would provide a good sampling of the country. At that time we had no idea that Hugh would be working in Calgary when we made flight reservations for roundtrip tickets from Houston to Casablanca. Thus the trip started in Calgary when Hugh flew to Houston where he met Becky who was returning from a meeting in Chicago. Friday, 1 8 Nov 2005: Hugh and Becky depart for Amsterdam on Continental while Robin and Steve depart from Newark on Delta for the RHATT rendezvous in Schipol Airport. Saturday, 19 Nov 2005: Robin and Steve had arrived in Schipol a few hours before we did and were waiting for us with the now famous RHATT arrival sign. We had a few more hours to kill before we departed for Casablanca via Madrid on Iberia Airlines. Fortunately we had privileges in the KLM Crown Lounge where we celebrated our safe arrival and anticipated the next leg of the trip. We discovered in the Crown Lounge that Becky’s Blackberry was working both for email and telephone. We called our barge broker to confirm our appointment for the following week and get directions to his office. We left the lounge in plenty of time to do some last minute duty free shopping as well as get our boarding passes for the flights to Morocco. The equipment from AMS to Madrid was operated by Iberia…this is a budget airline and should be avoided whenever possible. They even charge for the water (€1.50), but the toilets were still free. The transfer in Madrid was unremarkable…we did have enough time to buy a sandwich and a beer before boarding the Royal Air Maroc aircraft for Casablanca. This was much better service than Iberia with even a snack and free beverages (read beer). We arrived in Casablanca a few minutes late, but cleared customs and immigration without problems and found our driver waiting to drive us to the Meridien Hotel. After a pleasant check in, Steve and Robin retired to their room for the night (it was about 10:30 local time), but Hugh and Becky felt the need to unwind in the lounge after 24 hours of traveling. The beer was fine, cold and crisp, but the most exciting discovery was the Moroccan olives. They were a wonderful compliment to the beer and provided a good indicator for the tastes that were waiting for us to sample. Sunday, 20 Nov 2006: After a much needed night’s rest, we began the day with the breakfast buffet in Meridien which featured a nice selection of both European and Mediterranean dishes. Steve and Hugh walked to the Budget rent-a-car office to collect our car for the next week…a Renault Clio with a 1.4 liter engine, 37,000 kilometers on the odometer and a very weak clutch. We managed to get all of the luggage into the trunk and started the journey towards Fes. We drove for a while along the coastal highway; at Mohammedia we got directions from a traffic cop to the autobahn to Rabat and Fes. We diverted off the highway at Meknes to visit the ancient Roman ruin of Volubilis. This is a wonderful ruin which is the southern most limit of the Roman Empire. The site is vast and has some exquisite mosaics. The city was one of the finest examples of Roman architecture until Moulay Ismail pillaged the city to recover building materials for his palaces. The splendor of the city has been compromised, but fortunately, Volubilis is now a UNESCO site and enough has been reconstructed to provide an inspiring visit. The drive from Meknes to Volubilis wound through endless olive groves; the olives provide a significant contribution to the local economy. They are excellent quality and cheap with several tasty methods of curing. 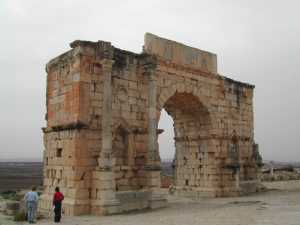 The ride from Meknes to Fes was about an hour; we had excellent directions to our Ryad and managed to drive right to it. One of the local citizens on a motorbike was hoping we would get lost and require his guide service to find our accommodations. I’m sure he does a thriving business, but Saint Christopher was with us, and the wannabee motorbike guide drove away disappointed as we knocked on the door of the Ryad La Lune et Soleil. A Ryad (translation = garden) is a large home built around a center courtyard. La Lune et Soleil was converted (westernized) about 3 years ago and had 4 guest rooms. We each had a huge suite for the equivalent of $110 per night. Because we arrived late in the evening we had arranged to have our first meal in the Ryad. Robin and Steve had made the arrangements by email and ordered a lamb tagine, which was served in their suite. Our hostess spoke only French, but with our basic French skills we were able to communicate that our immediate needs required a cold beer and a bottle of red Moroccan wine. Following the excellent dinner we enjoyed the late night ritual of single malt and chocolates. 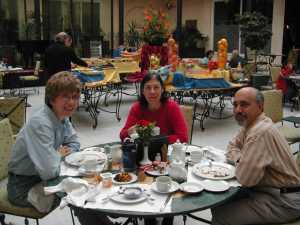 Monday 21 Nov 2005: Breakfast in the Ryad was typical continental. We met our host, Jurgens, who was delightful and eager to share his excitement for Fes. We had arranged for a guide to show us the medina. Rashid met us at 10:00am to begin the tour. He was an official guide with a university degree in linguistics. He provided an excellent tour explaining the life and customs of the Medina. The external appearance has not changed in centuries. The streets are so narrow that only donkeys, push cars and bikes could negotiate the paths. Commerce was conducted from small stalls which lined the streets. Daily life still involved taking bread dough to the communal bakery every morning and trips to the common fountain to collect water for the home. Most homes by now have running water and sewer, but some still rely on the fountains. Rashid took us to the Koranic school to show the excellent craftsmanship of the plaster facades, tile floors, wainscoting and decorated wooden ceilings. We visited an upscale shop for ceramics (for western tourists), a spice souk, the grand mosque (closed for renovation), the university, the yarn dyeing street and the famous leather tannery. One of the more interesting stops was at a woodworking museum which was a converted caravan market where traders would sell their goods and stable their camels. We returned to the ceramic store to purchase gifts and Moroccan souvenirs. We asked Rashid to take us to a suitable lunch stop where we discovered the Moroccan salad which consisted of many small bowls of various preparations of tomatoes, eggplant, olives, zucchini, cauliflower, green beans, lentils and beans. After lunch Rashid took us by petit taxi (maximum 3 persons per cab but very cheap) to the Grand Palace and the Jewish quarter. That completed the tour for the day, we returned to the Ryad after an unsuccessful search for an ATM machine and a semi successful visit to a cyber café. (We had so much trouble with the keyboard that we couldn’t reach all of the websites we wanted to). We returned to the Ryad for happy hour and dinner of baked chicken and cous cous with vegetables. Tuesday, 22 Nov 2005: Following breakfast we attempted to pay our bill with a credit card, but Jurgens explained that he preferred cash and would be happy to accompany us to an ATM machine and then show us the road to Marrakech. We completed our transactions and said farewell to Jurgens and Fes, then headed south for the 480 kilometer drive to Marrakech. We had planned to stop in Azrou to look at carpets, but after a couple of unsuccessful attempts to find the souk, we decided to continue our 8 hour drive with the goal to arrive before dark. The first half of the drive was hilly and curvy, progress was slow. The second half provided straighter roads and much faster speeds. As we arrived at the outskirts of the city we noticed a significant increase in bicycle, moped and donkey cart traffic. Steve was navigating and directed us to the designated meeting point…a Shell gas station. We called the Ryad to announce our arrival and they said they would be there in 3 minutes. Fatah, the manager, arrived just as he said he would; he helped us park the car and then led us through the maze to the Ryad Tinmel. This Ryad was beautifully restored; we each had a comfortable standard room. Our first request was for a cold beer to celebrate the successful drive from Fes…much to our chagrin Fatah told us there was no beer or wine in the house but he could accommodate us the next day. We then asked for a restaurant recommendation and he sent us off to find the Dariah. At least this place had beer, but it was only in 25cl bottles. The prix fixe menus were typically Moroccan; there was musical entertainment and a belly dancer, neither of which made a positive contribution to the dining experience. As we returned to the Ryad, Fatah offered us the guide service of a friend rather than that of an official city guide. It seemed to be a reasonable offer which we accepted with plans to start our tour at 10 the next morning.